During the early 1930s, outlaws rampaged across much of America, seemingly robbing banks and kidnapping at will. 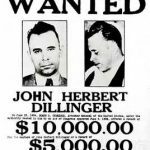 Some of the more famous of these Public Enemies were Baby Face Nelson, Pretty Boy Floyd, Bonnie and Clyde, Machine Gun Kelly and Alvin Karpis and the Barkers, but John Dillinger was undoubtedly the star. A wave of celebrity kidnappings and the murder of four law enforcement officers in Kansas City in June 1933 during a botched attempt to rescue a veteran bank robber made it clear that a national police force was required. Local police were forbidden to cross state lines, so the Bureau of Investigation (later called the FBI), part of the Department of Justice, was an obvious candidate for this national police force. However, it had to pass through a steep learning curve since it was under-funded and its agents were not originally allowed to carry guns. Although he had already robbed several banks, George “Babyface” Nelson (real name Lester Gillis) became famous when John Dillinger joined his gang following his escape from the Crown Point Jail. After robbing two banks together, a vacation at the Little Bohemia Lodge in Wisconsin ended abruptly when FBI agents bungled a raid, killing an innocent bystander. Nelson became the FBI’s main target after Dillinger was killed in Chicago on July 22, 1934, so none of his friends would risk sheltering him. Roaming from tourist camp to tourist camp, Bureau agents finally found him near Chicago, Illinois, and he was fatally wounded in a shootout where he killed two agents on November 27. A mobster named Rocca (Ted de Corsia) arranges for Lester Gillis (Mickey Rooney) to be released from prison to kill a union organizer. Determined to go straight, Gillis refuses, and is framed for murder, but his girlfriend Sue (Carolyn Jones) helps him escape. Wounded while robbing a drugstore, he is taken by Sue to a sanitorium run by Doc Saunders (Cedric Hardwicke), an unlicensed doctor. Joining up with John Dillinger (Leo Gordon) after he escaped from Crown Point, Nelson panics during the robbery of a payroll delivery, causing the death of gang member John Hamilton. The gang is sent to relax at the Little Bohemia Lodge, while Dillinger recovers from a wound, but Nelson contacts Fatso Negri (Jack Elam), who plans all of the gang’s jobs. The FBI has been following Negri, but Nelson notices the agents preparing to storm the lodge, enabling the gang to escape. When Dillinger is killed at the Biograph Theater in Chicago by FBI agents, Nelson takes charge of the gang. The FBI forces Negri to lure Nelson’s gang into a trap, but Nelson has decided to betray his partners, and escapes with the money. By this time, he has become a trigger happy maniac. Aware that agents are closing in, Nelson and Sue try to flee to another hideout, but he is fatally wounded in a shootout with FBI agents. The opening narration explains that the movie is about Jazz, Jalopies, Prohibition and trigger happy punks. Prohibition seems to have been thrown in because it sounds cool, even though the events described in the film took place after Prohibition was repealed. Although director Don Siegel claimed that he and Daniel Mainwaring, the script writer, had checked the archives of several newspapers, the script looks like the research consisted of reading newspaper headlines from the period. Several key events are relatively accurate, but the rest of the movie seems to have been made up. To be fair, most of the books on the Public Enemies were published after the movie came out. Sooooooo, what did the script get wrong? Let’s start with the young lovers. After the escape from prison, Sue suggests that Gillis take her last name, Nelson. While it is a nice touch to have Gillis take his girlfriend’s last name, the real Gillis had adopted the George Nelson alias when he started robbing rich families in Chicago, years before the events presented in the movie. Furthermore, the real Gillis married Helen Wawzynak and already had children before he started robbing banks. In fact, Helen had brought their eldest child with them on several jobs until the increased police attention forced her to stop. The chronology of the movie is a little mixed up. The screen Nelson graduates from holding up drugstores to robbing banks after he joins John Dillinger’s gang. Actually, Nelson had started robbing banks in 1930, and he already had his own gang when Dillinger broke out of Crown Point. Moreover, Nelson had supplied much of the money used for bribes to smuggle a pistol into the jail to help Dillinger escape. Although gang member John Hamilton dies during the failed payroll robbery, the real man was fatally wounded when Dillinger, Homer Van Meter and Hamilton shot their way through a checkpoint when they were on the run after the raid on Little Bohemia. The massive manhunt made it difficult to find an underworld doctor until they found refuge with Dock Barker of the Barker-Karpis Gang. However, Hamilton died from his wounds and was buried in a rock quarry. The movie was dedicated to “J. 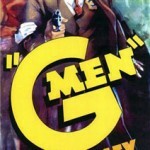 Edgar Hoover, who had forged the FBI into the top crimefighting organization”, so it should not be a surprise that the Bureau’s agents receive a favorable portrayal. In particular, the raid on the Little Bohemia Lodge has been completely whitewashed. The film’s lodge seems to cater solely to outlaws, since there are no other guests, and the FBI agents carefully surround the lodge before launching the raid. Determined to avoid the embarrassment of Dillinger escaping yet again, the real agents hastily charged the lodge and opened fire on the occupants of a car leaving the lodge without confirming that any of the outlaws were actually in the car, killing the driver and wounding a passenger. The script even shifts the blame for the civilian’s death to Nelson, showing that he delayed his escape to shoot the owner of the lodge because he had been sniffing around Sue. At one point, Nelson gets his fingerprints removed, but Doc Saunders screwed up the operation, so Nelson kills him. Despite Nelson’s fury, the fingerprint removal operation does not seem to hurt that much. When Fred Barker and Alvin Karpis paid Doctor Joseph Moran to change their fingerprints, the process involved tightening rubber bands around the individual fingers to cut off circulation, and then injecting cocaine into each finger before cutting off the meat of each fingertip. The next three days were spent in a morphine-induced fog. The screenplay works hard to show that Nelson becomes increasingly bloodthirsty. After Dillinger’s death, he was about to kill a hostage but lets him go out of sympathy since he is short as well. This is completely fanciful. Nelson never killed a hostage. In fact, I have never read of a hostage being killed by any of the Public Enemies. In the end of the film, Sue drags him to a graveyard after the final shootout with Bureau agents and he makes her kill him because he realizes that he has become a homicidal maniac. Once again, this seems to be a figment of the screenwriter’s imagination. 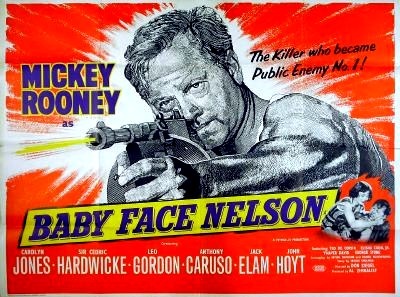 The real Nelson would not hesitate to kill if he was in danger, but that could be said about all of the Public Enemies. It is not a great movie, director Don Siegel would later make better movies like Two Mules for Sister Sara (1970). A running theme is that Gillis was annoyed that people made fun of his height. A condescending Rocca constantly calls Gillis ‘Little Man’, while Dillinger nicknames him Babyface. The role was ideal for Mickey Rooney, who had spent over a decade playing the relentlessly optimistic teenager Andy Hardy, whose response to every crisis was “Hey gang, let’s put on a show!” However, he had came home from WWII to find that there were few roles for a 5’2” adult with a baby face. Doc Saunders is a slimeball, who repeatedly gropes Susan. Hardwicke agreed to be in the movie despite the low salary because he had always wanted to play a bloody gangster. If the film’s climax looks rushed, that’s because it was. Producer Al Zimbalist ran out of money at the end, so three days of shooting had to be crammed into a single day. I suspect that Bonnie and Clyde (1967) was a reaction against movies like this and Machine Gun Kelly, which portrayed the Public Enemies as ruthless villains without any redeeming features.